I tried out Second Life for the first time recently. Couldn't get the hang of it. I got bored in the tutorial island and set off to explore the real world before I really understood the commands. I went to a Reggae club, and stood around awkwardly until somebody nearby finally explained how to make my avatar dance. It wasn't as fun as it would have been if I could have figured out how to turn on the audio. Then, because I had heard that Second Life had become an interesting forum for building political communities, I searched for some political sites. I started with the Hillary Clinton campaign island (no endorsement or non-endorsement implied). Unfortunately, my avatar was still dancing like a fool to an inaudible Reggae beat. I logged out. For all I know, my automaton is still there at the Clinton headquarters silently dancing. Meanwhile, the adrants blog has faint praise for Second Life in its review of this anti-obesity ad. I'm not holding my breath that this campaign will cure our nation's eating problems. My colleague Willie Lockeretz is in his final pre-retirement year as a much loved and admired professor in the program on Agriculture, Food, and the Environment at the Friedman School at Tufts. This week, following an annual tradition, he presented his eloquent multimedia yet PowerPoint-free presentation about American agriculture and rural life in the 1930s. Willie uses the songs of Woody Guthrie and other country musicians, and the priceless yet copyright free images of the Farm Security Administration, to bring to life the dreadful and inspiring story of America's passage through the Great Depression. In the dark lecture hall, I see Willie's slide of Walker Evans' famous photograph of the graveyard near the steel mills in Bethlehem, PA, and remember my final high school years spent there in the midst of the city's economic depression of the 1980s as the last factories were closing. I see the slide of a hobo and remember my great uncle's story, told to me from his hospital bed near the end of his life, about riding the freight trains for free to get home to the Midwest from college in the 1930s. 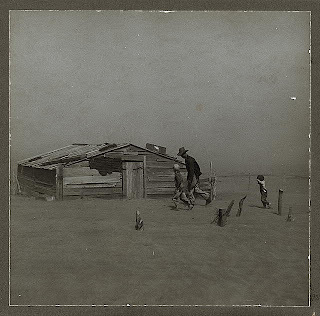 I see a slide from the Dust Bowl in Oklahoma and remember my hot sweaty summer as a 14-year-old working on my grandparents' farm there, before the farm was sold and they passed on. I think of my other grandfather, who escaped from Russia to the prairies of Canada in the late 1920s, just in time to live through the Depression here in the Americas. Where will we be if, in our privileged lives so far removed from the soil, we forget these things in years to come? A blog from the only Ph.D. food chemist turned Jivamukti yogi who ever wrote out of the blue to the U.S. Food Policy email address. I wrote back to encourage him to post the tell-all story of his experiences in the food industry. The enviroblog linked to this YouTube ad. 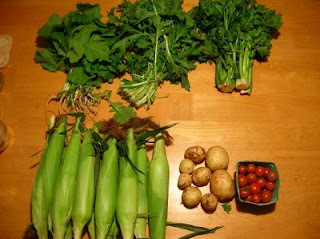 I enjoyed this New England food blog, after following a link to it from a comment at U.S. Food Policy. It resonated with what my family has been exploring in the very same fields, forests, and farms. Formula companies sometimes attempt to use the past tense to describe their heavy-handed marketing campaigns at the expense of breastfeeding. "Sure, we used to do wrong," they might say, "but now we promote breastfeeding." A breastfeeding advocacy website has an interesting series of reports about industry-sponsored websites that promote formula under the guise of simply offering motherly advice. I read at PR Watch, for example, that Mothering Magazine reports that the Moms Feeding Freedom blog is linked to the International Formula Council. The advocacy website banthebags.org reports that the Moms Feeding Freedom blog has started deleting comments critical of formula industry marketing. Fortunately, archived copies of the original comments are available here. The site reminds me to link to the Washington Post's excellent coverage last month of a formula industry coup, convincing a federal breastfeeding promotion campaign to tone down its most potent print ads. 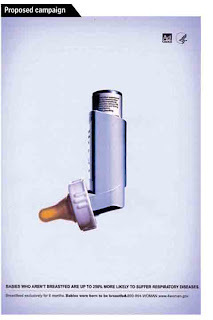 The original proposed ad graphically emphasized the association between formula feeding and risk of respiratory disease (click for larger image). 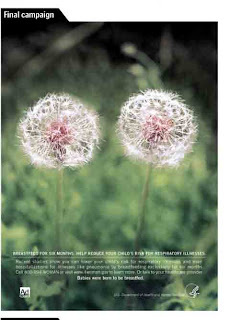 The final ad offered a pointlessly bland graphic, and required close reading to understand the same message. I imagine some readers may find the original proposed ad too blunt. Addressing that question puts me in a bind as a writer. I can write truthfully: "Some women cannot breastfeed, for medical or employment reasons. Formula is a satisfactory replacement, at least in the United States." But my fingers cringe hovering over my keyboard, because those same true sentences are also industry talking points that are used to exaggerate the hardships of breastfeeding and the quality of formula. You have to read those sentences in the same context with this one: "Almost all women can breastfeed, and breastfeeding is best." Regardless of which ad you prefer, at least two things are clear as day: the formula industry should not have been given the opportunity to sway the choice of ad, and hospitals should stop routinely giving out bags of formula to new mothers. 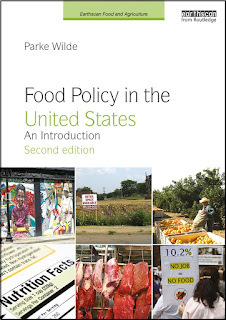 "Food for Thought," an interdisciplinary program at the University of North Carolina at Asheville, dedicated to "food information, food consumerism, nutrition, and health." McMichael, Powles, and colleagues in the Lancet this week: "To prevent increased greenhouse-gas emissions from this production sector, both the average worldwide consumption level of animal products and the intensity of emissions from livestock production must be reduced." U.S. News and World Report last month covered the painfully difficult policy dilemmas at stake in recommendations about folate fortification. Folate, of course, is protective against birth defects and it may also be protective against the formation of some types of cancer. At the same time, Joel Mason at the Friedman School of Nutrition Science and Policy at Tufts has been exploring whether folate may promote the growth of cancerous cells in the colon after they have begun to reproduce improperly. From the newsmagazine: "What we've discovered," says Joel Mason, a Tufts University gastroenterologist, "is that folate seems to have a paradoxical effect." A discussion on NPR about a proposed restriction on fast food restaurants in South Los Angeles. A new website on ending childhood hunger around the world, with plenty of video content. Federal government's pork board developed McDonald's McRib Sandwich? The most surprising thing about the McDonald's McRib boneless pork sandwich is not its McFrankensteinian ingredient list. McRib Patty: Boneless pork (Pork, water, salt, dextrose, citric acid, BHA, TBHQ). McRib Bun: Flour (wheat flour bleached and enriched with thiamine, riboflavin, niacin, iron, folic acid, malted barley flour), water, high fructose corn syrup, yeast, vegetable oil (partially hydrogenated soybean oil, cottonseed oil). Contains 2 percent or less of dextrose, fumaric acid, calcium sulphate, salt, acetic acid, soy flour, monocalcium phosphate, ammonium sulphate, cornstarch, fungal protease, natural culture, ammonium chloride, ascorbic acid, azodicarbomide, mono- and diglycerides, propionic acid, phosphoric acid, corn flour, calcium peroxide, calcium propionate, dicetyl tartaric acid esters of mono- and diglycerides, ethoxylated mono- and diglycerides. McRib Sauce: Water, high fructose corn syrup, tomato paste, distilled vinegar, molasses, natural smoke flavor, modified food starch, salt, sugar, soybean oil, spices, onion*, mustard flour, garlic *, xanthan gum, caramel color, sodium benzoate (preservative), natural flavor (vegetable source), corn oil. *Dehydrated Pickle Slices, Cucumbers, water, vinegar, salt, calcium chloride, alum, natural flavorings (vegetable source), polysorbate 80, turmeric (color). The most surprising thing about the McRib is not its manipulative on-line marketing to youth. The most surprising thing about the McRib is not even its outrageous satire site featuring the "Boneless Pig Farmers Association of America" and their teary-eyed petition to save their farming way of life (though I was a little surprised that the first featured video's veiled borderline racist insinuation about city living and rap music was approved by McDonald's). No. The most surprising thing about the McRib is that the federal government's National Pork Board, whose every marketing message must be approved by USDA's Agricultural Marketing Service, proudly claims to be its creator. See the first page of the Pork Board's most recent annual report for 2006. What a pinnacle of hypocrisy for USDA to support this marketing at the same time that other federal government agencies struggle to address the obesity epidemic in the United States, including particularly wrestling with issues such as online food marketing to children and youth and the rise of high-fat fast food meals at the expense of home cooking. Item 1 in today's local food blogging is our summer meal a couple weeks ago, with striped bass caught by a family friend off Cape Cod, breaded and fried by my wife, tomatoes from a gardener in the neighborhood, New England wine, and home-made bread I made with a bread machine (hey, we're making little steps here). Item 2 is a quick report from the bicycle tour my family of four took for Labor Day weekend. My kids, aged five (on a trail-a-bike) and seven (on his own bike) pedaled the 11-mile length of the Minuteman rail-to-trail, and enjoyed a visit to their grandparents in the suburbs. My wife and I also biked over to visit the weekend and evening garden business of Jennifer Hashley, whose day job is directing the New Entry Sustainable Farming Project at the Friedman School of Nutrition at Tufts. At their home just west of Boston, Jennifer and her fiance Pete, who were featured in a great article in the Boston Globe this summer, raise chicken for eggs and meat and are starting up some hogs. Ever since reading about Polyface Farm in Omnivore's Dilemma, I had wanted to see in person these mobile chicken coops that are moved each day to deposit fertilizer in a new part of the pasture. The pigs' joyful meal of tomatoes, similarly, highlights the synergies from traditional diversified farms that get lost in monoculture. My wife and I left with our bicycle pannier full of wonderful produce and eggs and our heads spinning with ideas we look forward to trying. In July 1990, I was starting my first job out of college as associate editor and writer for the advocacy newsletter Nutrition Week, published by the Community Nutrition Institute (CNI). I recently reacquired my long-lost file of issues from that period. The front page gives me deja vu. Both houses of Congress this week defeated major ammendments [sic, how embarrassing] to the 1990 Farm Bill. Family farm advocates failed to win higher commodity price supports, and farm program detractors lost some important bids to reduce supports and restrict farm subsidies. "It's totally agribusiness as usual," summarized Brian Ahlberg of the National Family Farm Coalition. A side box on the front page quoted from a recent article in Rolling Stone by ex-liberal humorist P.J. O'Rourke. If it were up to him, how would O'Rourke deal with the 1990 Farm Bill? "Drag the thing behind the barn and kill it with an ax." Nutrition Today (no free link) this month reports that Eric Hentges, formerly head of the USDA's Center for Nutrition Policy and Promotion, the federal government center that oversees the Dietary Guidelines, has a new executive position with the International Life Sciences Institute (ILSI), an important scientific institute for the field of nutrition. Eric Hentges, PhD, is the new executive director of the North American branch of the International Life Sciences Institute (North America). In this capacity, Dr Hentges will work closely with International Life Sciences Institute North America members, trustees, science advisors, and staff to enhance the organization programs and the impact of its scientific output. He brings over 25 years of experience in nutrition education, research, planning, and administration to the job. 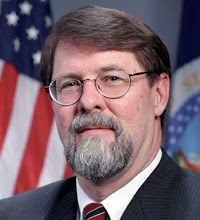 Since 2003, he has been the executive director of the US Department of Agriculture's Center for Nutrition Policy and Promotion, which is well known for its Dietary Guidelines for Americans and the Food Guidance System. Dr Hentges holds degrees from Iowa State University, Auburn University, and Oklahoma University. He and Susan Borra, vice president of the International Food Information Council Foundation and a past president of the American Dietetic Association, were married in early July. Congratulations, Eric! And best wishes to the Nutrition Couple of the Year! In addition to the experience mentioned in Nutrition Today's news brief, Hentges was previously a vice president of the National Pork Board, the semi-governmental USDA-sponsored board that funds advertising with the slogan "Pork. The Other White Meat" (see previous posts, and this one about the Other White Meat campaign). The explicit fad diet weight-loss advertising has been removed from the federal government's fluid milk and dairy checkoff program websites, following a successful citizen petition from the Physicians Committee for Responsible Medicine. However, fad diet weight-loss promotions based on low carb claims are still found on the web pages of the federal government's National Pork Board. The semi-governmental checkoff programs are established by Congress and administered by boards that are appointed by the Secretary of Agriculture from names nominated by the respective industries. All advertising and other messages must be approved as "government speech" by USDA's Agricultural Marketing Service. The money for their mandatory campaigns come from a tax on producers and importers, and collection of the tax is enforced by the Department of Justice. Because high-calcium and low carb fad weight loss diets are contrary to the Dietary Guidelines for Americans, which are supposed to be the federal government's authoritative statement for nutrition communication, I recently wrote USDA's Agricultural Marketing Service to petition for the end of low carb marketing through all the federal government's checkoff programs, including the pork program. Low carb marketing is past its prime in any case, so my best guess is they will comply with the petition and say they were planning to end that campaign anyway. I'll let you know how it goes. [See next post for a related story]. Tufts student Karina Picache's photographs from the neighborhood of the university's European Center in Talloires, France, include several fine images of food markets and restaurants. Sigh.